There are 118 elements on the periodic table, but how many of these elements can be found in nature? Some of the elements on the periodic table are strictly man-made and do not exist in nature. A few elements exist naturally but are found only in trace amounts. 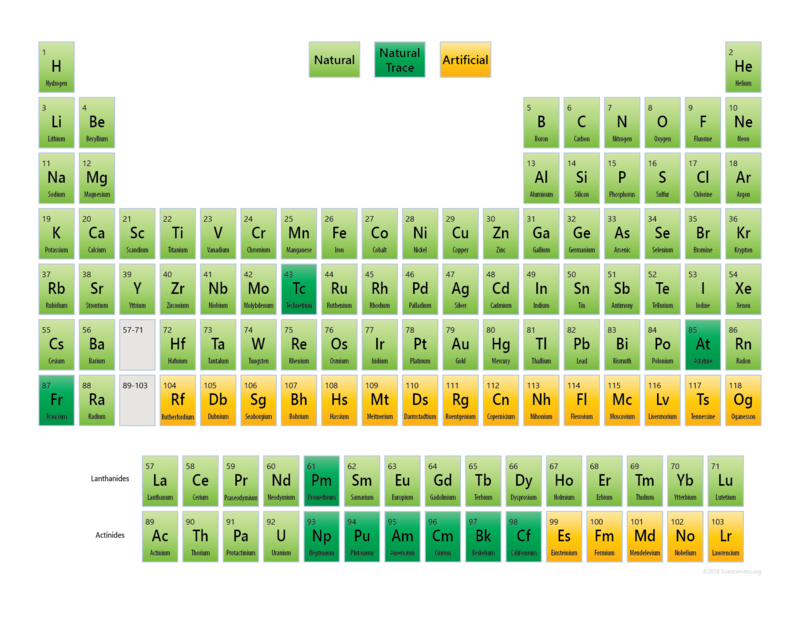 This table shows which elements appear in nature and which are artificially produced. The ten dark green elements corresponding to elements found in nature, but in minute or trace amounts. Technetium (43) is a radioactive element produced from nuclear fuel in reactors. Very minute amounts of Tc-99 are created this way with a half-life of 210,000 years. Promethium (61) was first discovered in 1945 in radioactive materials produced in the Oak Ridge graphite reactor. Naturally occurring promethium was eventually detected from extremely rare radioactive decays of europium-151 and uranium. Astatine (85) is considered the rarest of the natural elements in the Earth’s crust. It is a radioactive element with short-lived isotopes. The longest half-life of an astatine isotope is only 8.1 hours. Even the name comes from the Greek word astatos meaning unstable. Francium (87) has never been seen in bulk amounts. It is also radioactive and its longest-lived isotopes have a half-life of only 22 minutes. Traces of the element has been detected in ores containing thorium and uranium. Elements 93-98 were originally produced by bombarding uranium in the particle accelerator at the University of California, Berkeley in the early 1940s. These elements were also found while testing radioactive fallout from nuclear explosions and waste byproducts of nuclear power reactors. All six of these elements have been found in trace amounts in samples of the uranium ore, pitchblende. Elements 99 to 118 have only been found from particle accelerator experiments. All of these synthetic elements are radioactive and short-lived. The remaining elements can be divided into two categories: native elements and non-native elements. A native element is an element which appears in nature in a pure form. Non-native elements are only found in nature as part of a compound. The native elements are the noble gases, carbon, nitrogen, oxygen, gold, silver, and copper. A PDF of this periodic table is available for download and offline printing.